1 of 3 Blend mayonnaise, milk, vinegar, sugar, 1/2 teaspoon of the salt, celery seeds and 1 tablespoon of the barbecue sauce. 2 of 3 In a bowl, mix cabbage, carrots and pears. Top with mayonnaise mixture; toss to coat. Cover and refrigerate for at least 2 hours. 3 of 3 Heat oven to 450 degrees F. Place chicken breasts on a rack over a baking sheet. Remove 2 tablespoons barbecue sauce to a small bowl; brush each breast lightly with remaining barbecue sauce, then sprinkle with remaining 1/2 teaspoon salt and black pepper. Bake at 450 degrees F for 30 minutes or until internal temperature of chicken registers 155 degrees F on an instant-read thermometer. Remove from oven and spoon reserved barbecue sauce over chicken breasts. 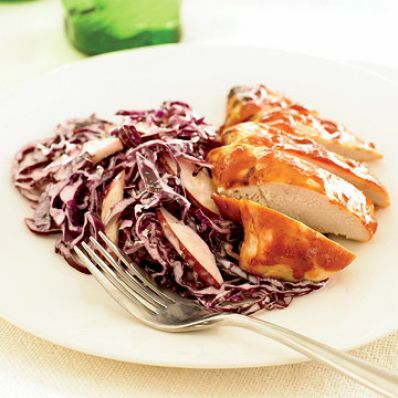 Serve with 1-1/2 cups slaw per person.